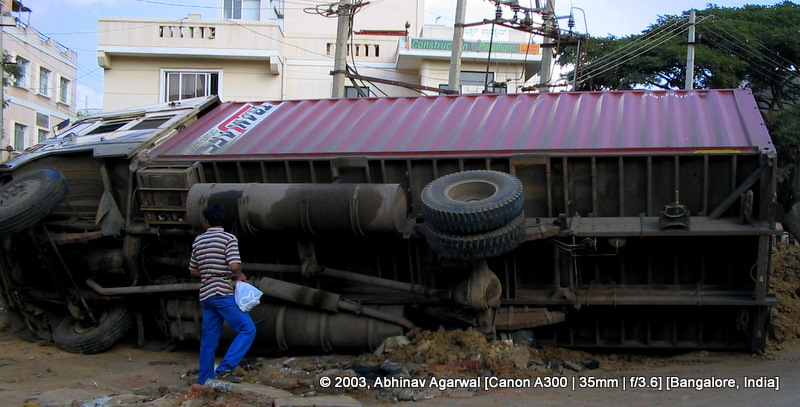 This photo was taken more than seven years ago, in 2003, in Bangalore. A city as large as Bangalore, with as many vehicles as in Bangalore, is bound to throw up opportunities for such photos on roads. In this photo though, I am not sure who the idiot is. There are several candidates here. And I will attempt to enumerate these worthy candidates. 2. The civic authorities, who choose to dig up roads, for mostly no apparent reason, then leave these roads dug up for months on end, and when they do fill up these trenches do not properly asphalt them, precipitating such accidents. 3. Telecom or the electricity supply company or the water supply board or some other distinguished civic or private body. Private telecom companies are notorious for digging up roads without authorizations, for using sewage pipes for laying fibre optic cables, and more. 4. Some other careless driver that precipitated this accident.